Dr. Gregory Sawyer is a well-known educator, lecturer, and practicing dentist based in the Northern California Bay Area. To learn more about Dr. Sawyer and his dental practice, visit www.losgatosdentalgroup.com. I saw a thirty-something man in my office last week with a cosmetic emergency. One of his veneers had fractured off of a front tooth. For somebody whose job involves meeting the public, this was a rather embarrassing situation. He had the broken piece, so we were able to bond it back temporarily and get him to his meeting on time. What got my attention was a question that he asked me: How long are veneers supposed to last? When somebody asks me how long certain dentistry will last, I have usually asked how long their car would last. After all, your car will fail quickly if it runs out of oil. And it will last a long time if you take good care of it and get it serviced regularly. And most of the dental repairs we do are similar in life expectancy. If you have great oral hygiene, and see your dentist and hygienist regularly, your dentistry will last a long time. But the underlying question behind his how long will they last question, was really: How much will this cost me to maintain for the rest of my life? Is it possible that those veneers that cost me about $1000 each eleven years ago will wind up costing me $10,000 each or more to keep them nice during my lifetime? Would he have made the same decision if he understood that was a likelihood? But what about elective cosmetic dentistry like veneers? Most people realize that is unrealistic for repairs to their teeth to last longer than the teeth had lasted before they needed repairing. People intuitively realize that Dr. Riley was right. But what about the longevity of an elective procedure? The teeth he had veneered had perhaps had nothing more wrong with them than being stained, crooked, or mis-shaped. He had not realized that the veneers would need to be replaced many times in his lifetime at the time he made the decision to have the teeth veneered. What if he had another choice to improve his smile? Today, in many cases we can use short term orthodontics to straighten your front teeth in less than six months, whiten them by many shades with our exciting new whitening protocol, and do a minor reshaping of the teeth to get a great smile that does not need periodic replacement for the rest of your life. Even if it cost more (it does not), wouldn’t that be a more reasonable choice in the long run? We at Los Gatos Dental Group take our minimally invasive philosophy seriously. We can even extend our philosophy to include some elective cosmetic procedures. Now that we have all seen the movie Avatar in 3D, some of us more than once if you believe the attendance figures, let me tell you how we use 3D imaging in dentistry. We have recently installed a cone beam 3D X-ray machine at Los Gatos Dental Group. I admit that our motivation was primarily to make implant placement safer and more predictable. But what I have seen in six weeks of reading the 3D X-rays that we have taken has convinced me that we should be imaging everybody in 3D, not just implant patients. Take this case, a young woman who has had multiple visits to her physician complaining of sinus congestion. She has been repeatedly treated for sinus infections and other presumably allergy related symptoms to little avail. This is an X-ray, that is at right angles to the traditional X-ray, and which has been generated by our 3D X-ray machine. 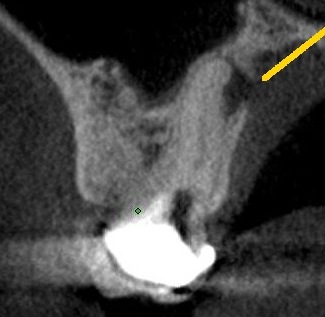 At the left end of the yellow line is an abscess, at the end of a root canal treated tooth, that has invaded the sinus. 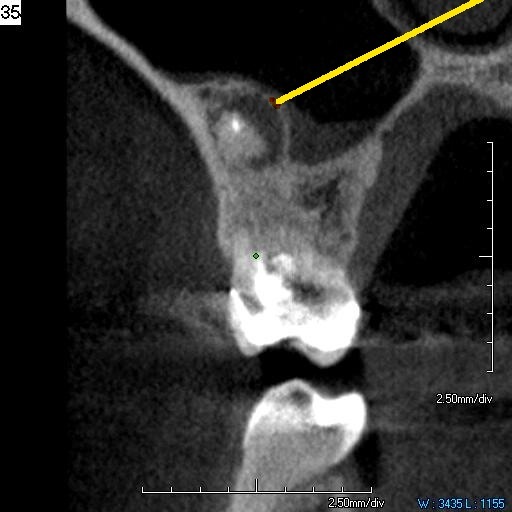 The cause of her sinus infection is this abscess, which is not visible on the traditional 2D X-ray, because the darkness is hidden by dense bone both in front of and behind, as well as the root of the tooth. The tooth doesn’t hurt, so nobody has connected the repeat infections with a tooth. The next image is another at right angles to the traditional X-ray. What you see at the end of the yellow line is another abscess at the apex of a root canal treated tooth. This tooth is also asymptomatic, so far. The abscess has just broken through the palatal plate of bone and is progressing towards the palate. Left untreated, this will likely begin to swell and hurt in the roof of her mouth. By diagnosing this sooner by 3D X-ray, instead of later by 2D X-ray, we have prevented pain and swelling. Now that I have been able to make these and other diagnoses by 3D, I can’t imagine going back to 2 dimensional radiography. But we are finding other uses for the images created by 3D radiography. I have been able to identify places where extra nerves enter the lower jaw. These extra nerves can innervate teeth in ways that dentists were not taught to numb. Most of the people who have these extra nerves to teeth are terrified, because dentists have not believed them when they have said that the tooth wasn’t numb. After all, we were taught in dental school that if your lip is numb, your lower teeth on that side are numb. I have long suspected the existence of these nerves, but I have had to find them by trial and error. SInce I have been sedating anxious patients my entire career, I have seen more than my share of people with this anatomical difference. Now I can see this before the tooth doesn’t get numb with the usual anesthetic technique. I spent last weekend in Florida studying the Poly Jaw Replicator. This instrument takes measurements in 3D from these X-rays to a jaw simulator, that is the first instrument to truly reproduce the actual jaw movements to such accuracy. The benefit will be comfortable crowns and bridges with little or no adjustment. The amount of time it will take to deliver complete mouth dentistry will be dramatically reduced, and the need for another visit to finalize the bite, when you are not numb, will vanish. As these instruments become more widely accepted by dentists, their price will come down. I predict that most dentists will be using 3D radiography within ten years, as it becomes the standard of practice. The public will demand more complete and earlier diagnosis. I have been thinking recently about the cost of neglect. This post is prompted by my recent examination of a 46 year old woman who has lost a root canal treated upper first premolar to biomechanical failure. That is not an uncommon occurrence in my implant practice. I would say that at least half of the implants that I place are replacing teeth lost to fracture or infection subsequent to root canal treatment. When we were taught root canals in dental school, there was a sense that we had saved that tooth forever. That is just not true. I have been hunting for research statistics to verify my observation that 20 years is about the norm for root canal success. When we perform a root canal, we remove not only the nerve of the tooth, but also the blood supply. In time, these teeth become brittle and less capable of handling the normal chewing forces, and they fracture off at or near the gum line. What got my attention for this woman, was that she had one three tooth bridge in the lower right, to replace a lost root canal treated tooth. And she had ten other root canal treated teeth. She has over $20,000 invested in her mouth, in various stages of failure. She is waiting for her income tax refund to replace the one premolar fractured now. I asked if she realized that, at her age, she was likely to lose all of the rest of the root filled teeth before she dies. A little arithmetic stunned her at the cost of the implants she would be needing. In today’s dollars, she will be facing over $40,000 in implant replacement. That is a lot of tax refunds. In today’s economy, some people are delaying visits to the dentist because they are not having pain. Is it not obvious what a false economy that really is? The delay of the diagnosis of tooth decay often results in pain, as the decay progresses undiagnosed and untreated. For avoiding the dentist to save some money, the problem has progressed from the need for a filling at around $200, to the need for a root canal and crown for over $2000. That is bad enough, but that root canal tooth is likely to be lost twenty years down the line, requiring an implant at double that cost. Now for the delay, the cost has multiplied 3000%. But what makes this even worse is the reality that all of this destruction is entirely preventable. By treating the causes of the decay in the first place, transmissible bacteria and low pH, we could prevent most or all of that destruction. The cost of dental neglect is far higher than any other means of budget cutting. A researcher from Department of Periodontics at Case Western Reserve University School of Dental Medicine, reported the first documented link between a mother with pregnancy-associated gum disease to the death of her fetus. The link was discovered when a friend of the mother of the stillborn baby introduced her to the researcher, Yiping Han. Han was studying the bacteria, Fusobacterium nucleatum, and it’s relationship to pre-term labor and stillbirths. This study caught my eye because F Nucleatum is one of the known periodontal pathogens that we test for using DNA-PCR, when we find menacing bacteria from the gums when we look under the microscope. The mother gave a history of bleeding gums during the pregnancy. Bleeding gums during pregnancy are not uncommon, indeed around 75% of pregnant women experience bleeding gums. Postmortem microbial studies of the baby found the presence of F. nucleatum in the lungs and stomach. The baby had died from a septic infection and inflammation caused by bacteria. The bacteria was also found in the mother’s mouth. It is now well understood that oral bacteria can make their way into the bloodstream through the bleeding gums. We are just now beginning to realize the extent of the potential for problems in other organs systems. And too many people still accept bleeding gums as normal. Bleeding gums are dangerous. WIth the numbers of people with gum disease, 50% over age 30, and the delaying of childbirth by so many women, we need to be more diligent in our explanations of the need for good oral health to pregnant or potentially pregnant women. And as I continue to remind all involved, the old paradigm of mechanical debridement, is just not enough to cure an existing bacterial infection. Brushing and flossing helps, but once you are infected, it is just not enough. The findings are discussed in the February issue of Obstetrics & Gynecology. I have had an epiphany. While I admit to recognizing that diet is important to health any many ways, I have been influenced by Dr. Dean Edell to resist dietary supplementation by pills. Dr. Edell is in a position to read more of the medical literature than any doctor who actually sees patients, so I credit him with being able to keep up with all the latest research. And he seems to be honest in his advice, so I tend to trust his advice to his listeners. But now I think he is wrong about nutritional supplements, like vitamins. His reasoning is that he is healthy and personally doesn’t take supplements. It is likely that he is correct in assessing his own needs. This week I attended a conference on the oral-systemic connection in Reno, where I shared the podium with Dr Lisa Marie Samaha, Dr, Lee Ostler, and Dr. Bill Domb, and Robert Maccario. Dr. Samaha presented case after case of people whose periodontal disease was helped greatly by nutritional supplementation. They still needed treatment to reach optimum periodontal health, but the improvement was unmistakable from the nutritional supplements. I saw her present briefly last November, and we have started offering nutritional supplements to our periodontal patients. But I admit it was half hearted. I didn’t understand the mechanism of how supplements helped, and I wanted to be able to repeat Dr. Samaha’s success in our own office. It was Dr. Ostler’s presentation that brought the epiphany. He explained the nature of a few genetic defects which make the body work harder to repair damage on a molecular level. I won’t try to explain, and I am not sure that I can. But suffice it to say that there may be about 20% of the population whose genetics interfere with the body’s defenses or repair mechanisms enough to affect there ability to defend themselves against the pathogens of periodontal disease. And if we can provide molecules to help them in the diet, their defenses or repair mechanisms can be more normal. I would speculate that Dr. Edell does not have any of these genetic anomalies, so he would be correct in saying that he does not need them. The day of genetic medicine and dentistry is coming, and soon. Doctors will be able to look at the entire genome for known genetic polymorphisms and either repair them or provide the work-around to help people avoid getting sick. Right now the reams of data from the entire genome is overwhelming and expensive to acquire. But the days of computer interpretation of the data are here and soon the practice of medicine and dentistry will be vastly changed by the information from the genetic testing. So my take on this new understanding, is that we must infer from unusual presentations of periodontal disease that nutritional supplementation is necessary or the person will not ever get healthy. And there is another bit of evidence that it is just not always the fault of the person that they are not healthy. We have placed too much blame on people for their dental diseases. Good oral hygiene certainly helps people prevent dental diseases. But for somebody who has been infected with aggressive pathogens, or is genetically missing the ability to effectively fight the pathogens, good oral hygiene is just not enough. I have never felt so needed. Now be well. If you are a cardiologist, a dentist, or even just any American over the age of 40, I recommend that you spend the fourteen minutes to hear the message above. Dr. Ridker, the director of the Center for Cardiolovascular Disease Prevention, Brigham and Women’s Hospital, was the keynote speaker at the American Academy of Periodontology this year. Dr. Ridker is proposing double blind studies to prove that inflammation from periodontal disease is related to death by cardiovascular disease. In a previous blog, I proposed that we stop discussing the possible relationship between gum disease and heart attacks and admit that the bacteria from the gum disease are causing heart attacks. Dr. Ridker is recognizing that inflammation is a more important indicator of cardiovascular risk than high cholesterol, and proposing studies to prove just that. I don’t know about you, but I don’t want to be part of the control group. The scientist in me wants the definitive proof, but the clinician in me already knows the likely outcome. We test the C reactive protein of our periodontal patients before we commence treatment. We see dramatic declines in the C reactive protein levels of the patients who get their periodontal disease under control. And as Dr. Ridker admits, your C reactive protein levels are a better indicator of heart attack risk than your cholesterol levels. Yet while most American adults know their blood cholesterol levels, almost none know their C reactive protein level. It has been estimated that 17% of American adults have obstructive sleep apnea, with 85% being undiagnosed. OSA is the most common chronic disease in developed countries. The person who is suffering from sleep apnea, has brief periods of interrupted breathing during sleep. He is unaware that this is happening, but the quality of sleep suffers greatly. The symptoms that most likely indicates risk for obstructive sleep apnea are snoring, fatigue, morning headaches, or daytime sleepiness. If you grind your teeth at night, your risk jumps to 80%. If you had four premolar teeth extracted for orthodontics, your risk is 80%. Why should you be concerned? OSA is a cause of high blood pressure, which leads to risk of death by heart attack. Reggie White, a famous retired football player, died of a heart attack attributed to OSA in his sleep at age 43. OSA would be a much more common cause of death on death certificates, if it were not for the fact that it only causes the heart attack that causes death. Most autopsies list heart attack as the cause of death without commenting on the cause of the heart attack. OSA also upsets the leptin cycle which causes your body to think it is hungry when it is not. The result is obesity. The weight gain that results then makes the OSA worse, which makes the weight gain worse. OSA is a cause of ADHD, ADD, depression and sexual dysfunction. OSA is a major cause of heartburn and gastric reflux. Why is a dentist interested in OSA? We see people every day with symptoms of OSA. Our office has a simple screening device which you wear at home for one night. When you return the device, we get a computer printout of how many times you have had episodes of obstructive breathing problems. If your problems are severe, we make a referral to a sleep disorders doctor. But if your problems are mild or moderate, you can be successfully treated with an oral appliance which holds your chin forward when you sleep (mandibular advancement device). I wear one of these appliances every night, and I have lost 25 pounds since I started. My blood pressure has dropped to normal, without pills that have side effects.